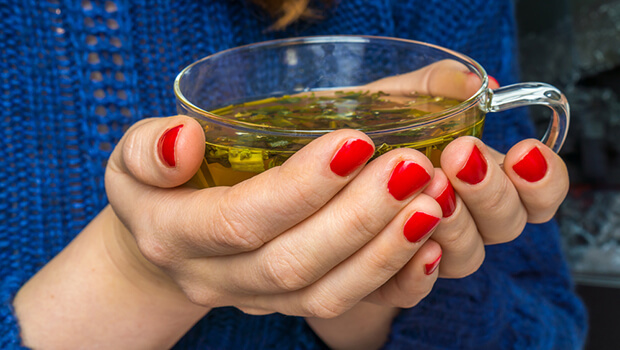 You don't have to be a reader of Women's Health Letter for long to learn what one of the most healthful beverages is: green tea. Just when you think the news about this potent drink can't get any better, new research comes out telling us even more. The latest news about green tea shows how it can help alleviate knee pain. For this study, researchers recruited participants between the ages of 40 and 75 who had experienced moderate knee osteoarthritis for at least six months. Patients whose arthritis had become severe, who had experienced heart problems or gastrointestinal bleeding, were pregnant, or were hypersensitive to caffeine or alkaline drugs were not allowed to participate in the study. The researchers were able to identify 50 patients who met their criteria and divided them into two groups. All of the participants took 100 mg of diclofenac, an NSAID used to treat pain and inflammation related to arthritis. But half of the participants also took 1,500 mg of green tea extract per day. The researchers assessed the knee pain the participants experienced throughout the study as well as their physical function and joint stiffness. While both groups experienced improvements in their pain, only the green tea group had better physical function. This group also experienced more significant improvements in total pain levels. None of the green tea recipients experienced any unpleasant side effects either. Green tea has powerful anti-inflammatory properties, so it's not surprising that it helped significantly. In fact, I'd love to see researchers conduct a study using green tea and a natural proteolytic enzyme (such as Reduloxin or Wobenzyme - available at Amazon.com) and leave the NSAID out of it. If you have osteoarthritis, you might be able to test this out for yourself. You can get the same amount of green tea used in the study by Green Tea Extract. And, in fact, the product used in the study contained just 33.973% epigallocatechin gallate, the bioactive compound that helps make green tea so powerful. This product actually contains a minimum of 40% epigallocatechin gallate, making it even better suited to provide pain relief. Of course, you can add a cup or two of green tea to your routine as well, whether or not you have arthritis. There are plenty of benefits to the beverage, especially if you can drink it in place of a sugary soda or syrupy coffee. But the extract is the easiest way to get a high dose of epigallocatechin gallate at once. Even if you don't have knee pain, there's probably some aspect of your health that can benefit from more green tea. Hashempur MH, Sadrneshin S, Mosavat SH, Ashraf A. Green tea (Camellia sinensis) for patients with knee osteoarthritis: A randomized open-label active-controlled clinical trial. Clin Nutr. December 18, 2016; [epub ahead of print]. doi: 10.1016/j.clnu.2016.12.004.